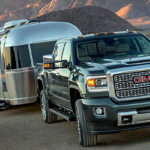 New 2019 vehicles are heading to dealer lots but many from the 2018 model year still remain. To reduce inventory, automakers are offering low-cost lease and financing offers. This month, there’s a deal worth considering on every full-size truck. The Chevrolet Silverado is one of the best-selling pickup trucks in the U.S. Last year’s model received a few upgrades ahead of the 2019 redesign: new paint, tire fill alert as part of the tire pressure monitoring system and a standard rearview camera. This offer is for the 2018 Chevrolet Silverado 1500 Double Cab LT All Star that is powered by a 4.3-liter V6 engine with an MSRP of $42,185. Chevrolet is offering current lessees of 2012 model year or newer Buick, Cadillac, Chevrolet and GMC vehicles a discounted amount of $2,949 due at signing. The offer comes with a 30,000-mile limit and expires Oct. 31. The GMC Sierra is a formidable full-size truck that verges on luxury in its top Denali trim. New for 2018, the Sierra gets a standard rearview camera and 7-inch touchscreen. The Sierra comes in six cab and box configurations, with two- or four-wheel drive, and in four trim levels. It can come equipped with one of three engines: a 4.3-liter V6, 5.3-liter V8 or a 6.2-liter V8. This deal applies to all 2018 Sierra models. Qualified buyers have until Oct. 31 to take advantage of the offer. The Ram Rebel is powered by a 3.6-liter V6 that is paired with an eight-speed automatic transmission. The 1500 Rebel has a 10,140-pound towing capacity and a 1,510-pound payload capacity when properly equipped. The truck listed in this offer comes equipped with Black Closeout trim and the Off-Road Package. It has heated front seats, dual-zone climate control, tinted windows, an 8.4-inch touchscreen display, Apply CarPlay, Android Auto, and two USB ports. This offer is for the 2018 Ram 1500 Rebel Crew Cab 4×4 with a 5-foot-7-inch box. It expires Oct. 31. Qualified buyers must finance through Chrysler Capital to be eligible. The dependable Toyota Tundra comes in five grades and is powered by either a 4.6-liter V8 or a 5.7-liter V8 engine. The larger engine delivers more horsepower and torque, but it’s thirsty. Both engines are paired with a six-speed automatic transmission. The Tundra comes in Double Cab and CrewMax cab configurations and either a short or long bed. Each Tundra comes standard with the Toyota Safety Sense P suite of safety technologies. This offer is valid for all Tundra trim levels and expires Oct. 31. Ram is keeping the previous-generation truck for one more model year as the 1500 Classic. Outside and inside, the truck carries over the improvements made for the 2018 model year, including a standard rearview camera and available Apple CarPlay and Android Auto. This deal is for the 2019 Ram 1500 Classic Express Quad Cab 4×2 with a 6-foot-4-inch box and the 27J package. 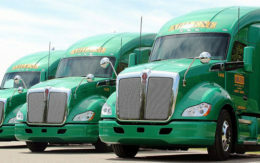 The Express is the truck’s midgrade offering. It has an MSRP of $36,940. This offer comes with a 12,000-mile-per-year limit. The midgrade Ford F-150 Lariat comes standard with two-wheel drive and is powered by a 3.3-liter V6 engine. It has either a SuperCab or a SuperCrew cab. The F-150 Lariat is available with either a 5.5-foot, 6.5-foot or 8-foot bed, depending on cab size. This offer is limited to 10,500 miles a year. The Nissan Titan comes in Single, King and Crew Cab configurations, but this deal is valid only for Crew Cab models in the SL or Platinum Reserve trim. The SL comes equipped with everything needed for performance and as a daily driver. It adds on leather-appointed seats and remote engine start. The Platinum Reserve trim checks all the boxes. Qualified buyers can choose the low-APR offer or choose $7,500 cash back on their purchase. The offer expires Oct. 31. Qualified buyers can get the redesigned 2019 Ram 1500 Laramie Crew Cab 4×4 with a 5-foot-7-inch box as part of this deal. The truck has an 11,540-pound towing capacity and a 1,930-pound payload capacity when properly equipped. It is powered by a 3.6-liter V6 that is paired with an eight-speed automatic transmission. The model is loaded with tech features, including an 8.4-Inch touchscreen display, nine speakers with a subwoofer, shark fin antenna, Apple CarPlay, Android Auto and a 7-inch driver-information display. Qualified buyers must finance through Chrysler Capital to be eligible for the low rate. This offer expires Oct. 31.